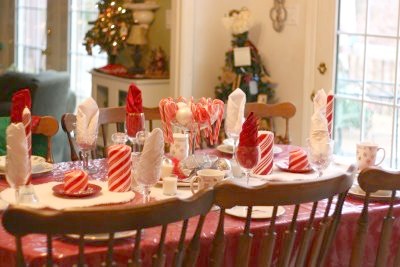 As I work on creating a new tablescape for our Christmas Eve festivities, I realize that one of the easiest way to glam up a table is by accenting ones table setting with an easy napkin fold, and an entire table can be done in minutes. 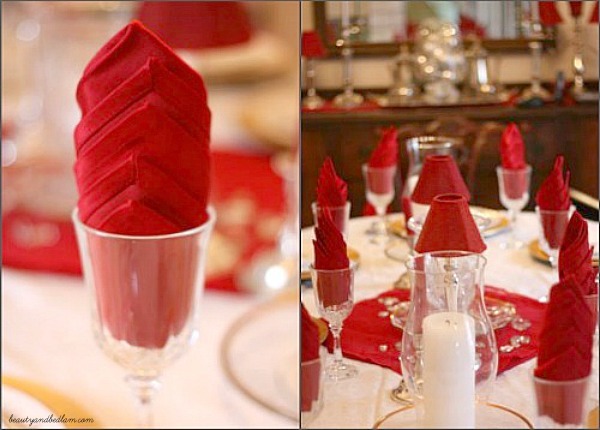 For me, the best part of dressing up your tablescape with napkins is that your children can take ownership and easily learn to fold the napkin themselves. It’s one of those “fun chores” that they’re happy to do. If you’ve forgotten some of the simple “rules” in How to set a beautiful table, just remember this creative acrostic. F-fork, O-plate (the shape), K-Knife, and S- Spoon (yes, for you type A friends, you must just forget the R). Don’t forget that the knife faces the fork because it protects the spoon. Click on through to see my easy Pinwheel Napkin Fold tutorial. My table set for Christmas Eve two years ago. THANK YOU for the FORK acrostic!!! You have saved me from a lifetime of etiquettelessness! That I can remember… I have never been able to remember the proper order. I set a Christmas Tea table every year at our church and I have to go around and look at everyone else’s table to make sure I get it right!! And I love the candy canes making a heart on the glass. TOO cute!!! Merry Christmas!!! Blessings! 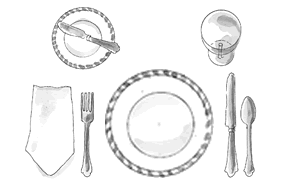 @Terri, remember – one thing, most people miss this detail, the knife blade faces the fork to protect the spoon.